HERE WE HAVE THE ENGINE FROM A VAUXHALL ASTRA G MK4 1.7 DTI 2001 TO 2005 SHAPE, IT IS IN GOOD USED CONDITION, THE CAR IT CAME FROM HAD 120,000 MILES ON THE CLOCK. THE CAR WAS ON A 53 REG SO PLEASE SEE ALL PICTURES TO MATCH TO YOURS. ITS THE 1.7 DTI diesel. THIS ENGINE IS STILL IN THE CAR SO POTENTIAL CUSTOMERS CAN COME HERE TO SEE IT RUN AND CHECK MILES COVERED ETC, THERE ARE NO ISSUES AT ALL WITH THIS ENGINE, NICE CLEAN WATER AND OIL. NOT MANY FOR SALE GIVE THIS PEACE OF MIND. AND HAVE IT READY FOR COLLECTION. IT COMES WITH THE INLET MANIFOLD COMPLETE WITH INJECTORS AND CLUTCH AND FLYWHEEL THESE ARE INCLUDED FREE WITH THE ENGINE. THE ALTERNATOR, GEARBOX, STARTER, PAS PUMP (if fitted) AND COIL PACK/S WILL BE REMOVED. THIS IS A CASH ON COLLECTION ITEM AS I CANNOT SEND, BUT IF YOU ARRANGE A COURIER WE CAN PALLETISE READY FOR COLLECTION, pay pal accepted in this case. DEAL TO BE COMPLETED WITHIN SEVEN DAYS MAX PLEASE. FOR A FAST ANSWER TO QUESTIONS PLEASE CALL ME ON. DONT WAIT A MONTH AND THEN GET IN TOUCH, IF YOU NEED IT FAST MAKE USE OF THE COURIERS WE USE, ITS NEARLY ALWAYS NEXT DAY. 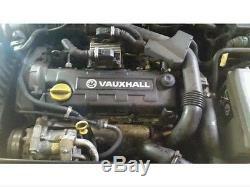 The item "VAUXHALL ASTRA G MK4 1.7 DTI ENGINE 2001 To 2005 CARRIAGE AVAILABLE 120, k" is in sale since Sunday, December 25, 2016. This item is in the category "Vehicle Parts & Accessories\Car Parts\Engines & Engine Parts\Complete Engines". The seller is "astraboymk2" and is located in Bristol. This item can't be shipped, the buyer must pick up the item.